Choose & Star your favourite thoughts! From April 28th to May 8th, all members of the CCRSB community have the chance to review the answers we received to our online survey. Through this process called ‘Star’ you have the opportunity to see what other people had to say and to choose the answers that you agree with the most. It’s easy. Just click on the number of stars you want to assign to each idea! If you participated by answering the three questions, then you’ll get a personalized email from our partners at Thoughtexchange. If you didn’t answer the questions, but want to help choose the best ideas, you can join the process by clicking here. Remember, the survey is anonymous. So take this opportunity to tell the school board what’s most important now and for the future! 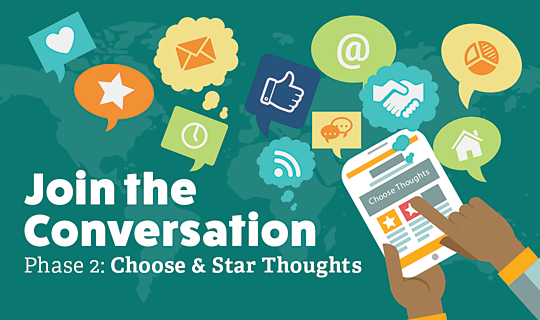 Join the conversation & Star your favourite thoughts! If you have any questions, you can send them to shareyourthoughts@ccrsb.ca.